A spirited and inspiring tale of hope and courage,LONG WAY NORTH tells the story of a young heroine persevering through a physical and emotional journey to find her explorer grandfather and his lost ship, the Davai. This award-winning animated movie offers an immersive cinematic adventure that brims with heart, action, powerful storytelling and gorgeous animation in equal measure. LONG WAY NORTH features an exceptional English voice cast of ChloéDunn, Vivienne Vermes, Peter Hudson, Antony Hickling, Tom Perkins, Geoffrey Greenhill, Claire Harrison-Bullett, Bibi Jacob, Martin Lewis,Tom Morton, Leslie Clack, Kester Lovelace and Damian Corcoran. *French voice cast includes Christa Théret, Feodor Atkine, Thomas Sagols, Rémi Caillebot, Audrey Sablé, Fabirn Briche, Gabriel Le Doze and Boris Rehlinger. 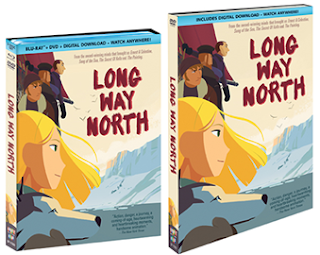 LONG WAY NORTH DVD and two-disc Blu-ray+ DVD Combo Pack contain English and French audio tracks, English subtitles and insightful bonus content. Long Way North is now available to purchase online and in stores near you.